The modern workforce includes 2.5 billion millennials, a group that expects rich experiences and the flexibility to stay connected across the various devices they use throughout their workday in an always-on economy. At the same, today’s workers show an increased appetite for using video, from personal devices to huddle rooms and conference rooms. In fact, several analyst firms say the market for large hardware-based video conference room systems is flat, while the demand for enabling smaller rooms is growing rapidly. To enable today’s increasingly distributed and remote workforce, organizations are adopting cloud-based unified communications (UC). From the start, unified communications has been focused on bringing together mostly real-time methods of connecting – voice, video, messaging, and web conferencing – so people can get their work done. The latest generation of unified communications as a service (UCaaS) adds support for mobility, streamlined integration with a range of apps, and team messaging so people can communicate wherever and whenever. Often enterprise environments feature numerous communications tools selected in an ad hoc method across different departments, divisions, and locations. On average, people use four-to-six communication apps at work daily. The chaos, and security risks, only worsen because employees often opt out of company-sanctioned apps to install ones on their own via the cloud. Plus, toggling between multiple tools to communicate and collaborate wastes time and distracts from the work at hand. In fact, research shows that each time a user has to switch between different tools to perform even simple tasks, it can cost up to 10 IQ points. For the modern worker, this translates into a frustrating, disconnected experience. For enterprises, the result is poor user adoption, lower productivity, a lack of control, excess cost for overlapping technologies, and struggles attracting top talent. No wonder so many IT leaders are eager to simplify their communications footprint both from an IT-management and user-productivity perspective. Cloud initiatives become increasingly attractive as they seek to also consolidate costs and increase flexibility in support of their company’s business initiatives. According to Gartner, only about five percent of companies with more than 250 employees have moved to the cloud. But a growing number of traditional companies are evolving from legacy-based phone systems to support their increasingly distributed workforces. By adopting UC, IT leaders empower individuals and teams to effectively connect and collaborate. That’s because UC makes it easier to reliably and visually connect and share information with people inside and outside of an organization, or across the world, across devices, desktops, and meeting rooms. Forrester has found that 43 percent of those interested in cloud communications want to integrate it into their existing application environment. 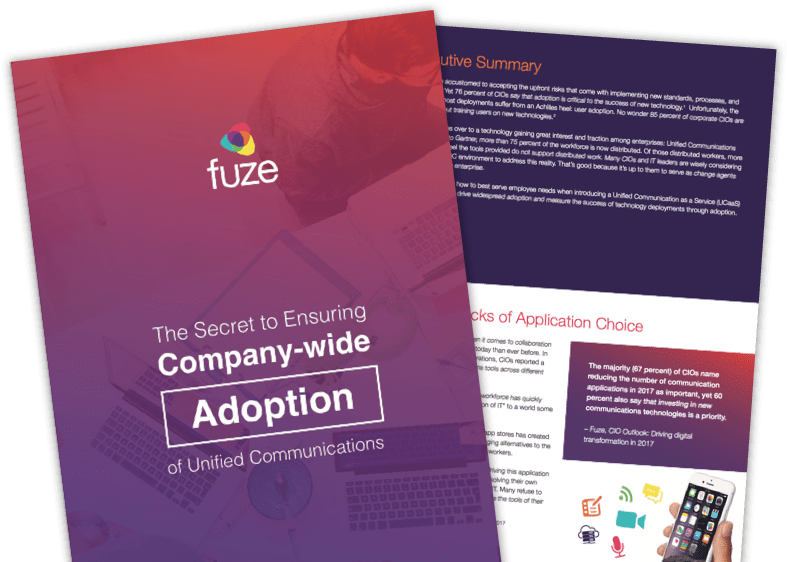 Fuze unifies communications into a single seamless user experience across any device, empowering today’s globally distributed workforce and always-on partners and customers to stay connected and collaborative. By enabling a consistent, high-quality voice, video, and messaging experience across devices – whether one in hand or in the room – we make it possible for people to connect anywhere. Based on insights gleaned from the consumer world, we designed our software for the utmost simplicity and usability. To that end, our unified communications moves with each user and connects to the applications they already use. Whether that’s Microsoft Outlook, Google Calendar, Box, DropBox or other tools, our solution fits naturally into the daily workflow. Moreover, IT staff appreciates the fact that we enable centralized provisioning, management and analytics, all built on a reliable global service architecture, and business-grade security. In addition to addressing the technology aspects of this evolution, it’s important to acknowledge people’s natural resistance to change and any perceived disruptions to their daily work routines. UC deployments undoubtedly represent such a development. 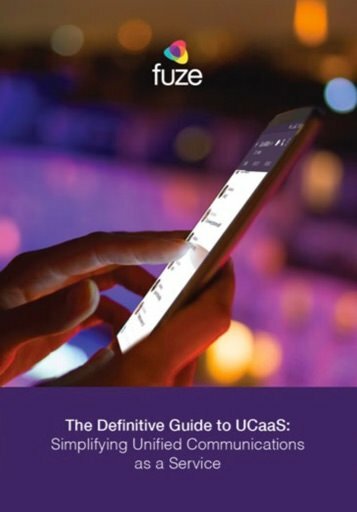 The introduction of UCaaS requires people to change the way they currently work, so it’s critical to develop a plan that increases the likelihood of adoption. Once you pinpoint the workforce’s preferences and habits, choose a UCaaS solution that is easy to learn and use and provides a great experience in the context of how work is already handled. That means it needs to integrate into existing line- of-business (LOB) and other workstreams so users don’t need to switch context to collaborate. Then download our eBook for practical advice on how to best serve employee needs when introducing a communication solution, and how to drive widespread adoption and measure the success of a UCaaS deployment.